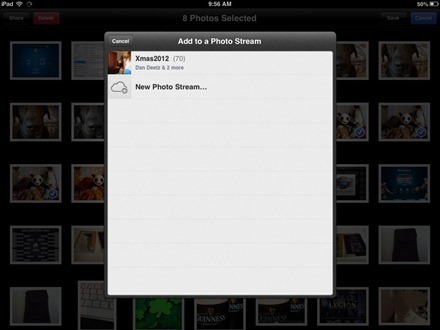 Photo Stream is one of the cool features that are part of Apple’s iCloud service. Shared Photo Streams are one of the best things about Photo Stream. A shared Photo Stream, as the name would imply, lets you easily and almost instantly share a particular set of photos with family and friends. 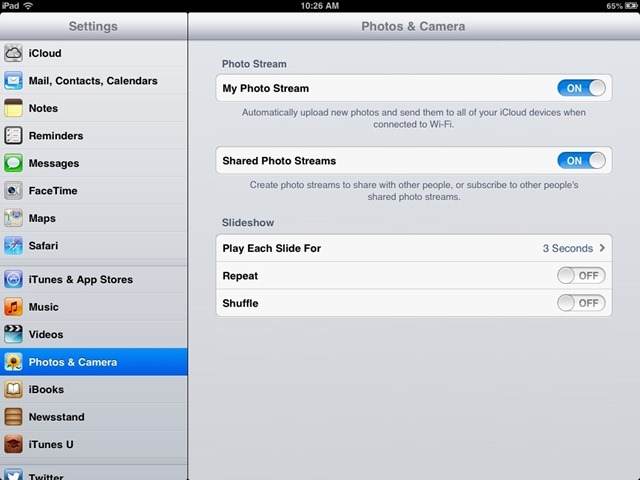 — Make sure that both My Photo Stream and Shared Photo Streams are turned On – as shown in the screenshot above. — If you haven’t created any photo streams yet, it’s easy to do so. Just open the Photos app, select an album (Camera Roll for instance), and ta[p the ‘Edit’ button at the top right of the page. Then tap to select the photos you want to be in your photo stream – each one you tap will show a blue circle and a checkmark. Once you have your selection, tap the ‘Share’ button at the top left of the page – and choose Photo Stream from the sharing buttons. — This will bring up a popover dialog where you can choose to add the selected photos to an existing Photo Stream or create a new Photo Stream. If this is your first one, then you’ll only see the latter option – so tap New Photo Stream. — The next popover will show a first field where you invite family and friends to your shared Photo Stream, then a field where you name the Photo Stream, and finally a field where you can choose to create a public website for the shared Photo Stream – just by toggling the button to On. Fill in the two fields and tap to turn the public website On. — Tap ‘Next’ and add a comment if you like on the next dialog that pops up. The tap ‘Post’. 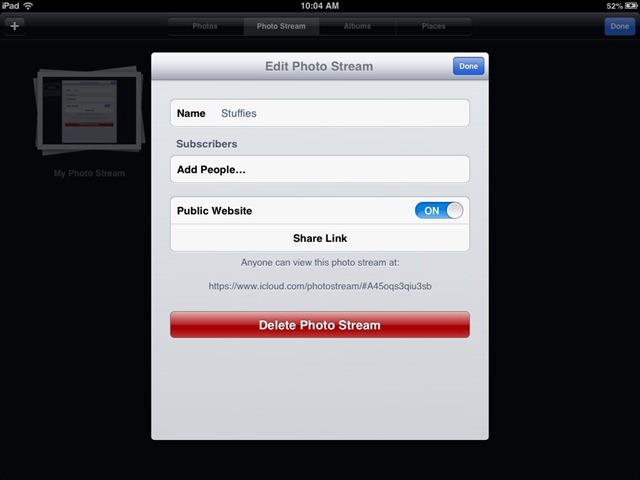 Now your new Photo Stream is created and has been shared to the people you chose. — Open the Photos app and tap on Photo Stream in the top row of tabs. 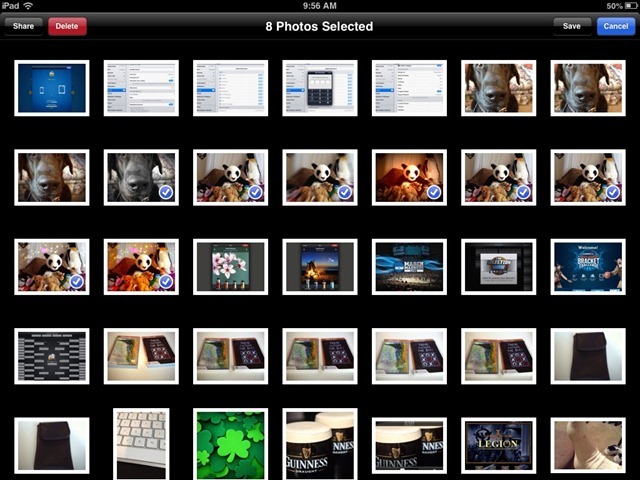 If the Photos app opens to the Camera Roll, you’ll have to tap on ‘Albums’ first and then select Photo Stream. — Tap on the ‘Edit’ button at the top right. 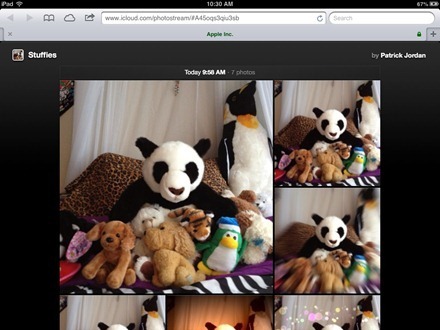 Then tap to select the new shared Photo Stream. — This will bring up the ‘Edit Photo Stream’ dialog. Tap on the ‘Share Link’ button towards the bottom of this dialog. The Share box will pop up and you can then share the public website link via email, Messages, Twitter, Facebook, or just copy the link for pasting into a note or similar. That’s all there is to it. This is a great feature for sharing a collection of photos easily and quickly with family and friends – have fun using it. Hat tip to Cody Lee at iDownloadblog for mentioning this one. I use the iPad and the iPhone a long time but I didn’t know that a public website can be created. Thanks a lt for this article. how do you import or copy “Shared” photostreams onto a computer hard drive? In iPhoto, if you’re subscribed to someone else’s Photo Stream, they’re automagically already there. If you’re on Windows, you can access them via the iCloud control panel. One other note: when in iPhoto on your Mac, if you click the Info button when focused on a shared Photo Stream, you can see who it’s shared with and what the URL is if it’s public, even if the Photo Stream was created on your iOS device. And, of course, vice versa. once iclund account is deleted will photos shared be deleted from my dads iphone or (icloud)?